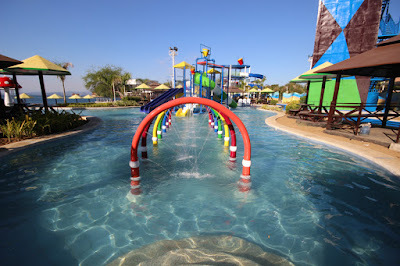 BoyRaket.com: Adventure Beach Waterpark Now Open to the Public! Colourful and Kid Friendly! These are the two initial impressions that I can say which can best describe the waterpark. First of all, it is just next to the popular Camayan Beach Resort and Ocean Adventure operated by Subic Bay Marine Exploratorium Inc. Flanked by the Sandy Beach just right after the multi-purpose Gazebo and situated in a cozy nook of the Park, this virtual oasis offers a refreshing pause from the hustle and bustle of the other Park attractions. It features a sprinkler system that simulates serein or rain that falls from a cloudless sky. Serein pronounced as ‘se-rain’ is from the French word that means serene or calm. So relax, take a breather and let the serein cool you down. PLAYGROUND FUN under the sun! Take a dip in this POOL and feel oh so cool! The SPRINKLERS are a treat in waters 3 feet deep. Take your trip to a whole new high! If its amusement you’re looking for, then this ride’s for you. Swing and Sway your way to a different kind of adventure aboard the MINI-VIKING SHIP RIDE. Equipped with seesaws, mushroom sprinklers and a mini water playground, this specially designed WADING POOL is sure to be a refreshing hit! Prep the kids, for they’re in for a real treat! Designed to delight both the young and young at heart, this wading pool offers several attractions for hours of fun. Ever wanted to play in the rain? Under the Gushing Mushroom you can do just that. Or maybe dance under the colors of the rainbow at Rainbow Falls. Shout with glee as you splash up and down the Splashing Seesaw. Rising above the water at the center of Wading pool is our very own Kidz Island with its own straight slide, a tube slide as well as a spiral slide. Go on a thrilling ride down the rapids atop custom-designed inflatables. Get crazy wet as you pass through waterfalls, or maybe steal a kiss from under the hanging bridge. Hold on tight and keep your head about, for you’ll never know what to expect down the LAZY RIVER! This 3 story high tower features two twisting and turning giant slides for twice the thrill and double the fun! Go up the ladder and be treated with the spectacular view of the ocean which will surely make the climb worthwhile. We dare you to climb up and feel the rush over and over again. These are some of the attractions or part of the amenities that they have in the waterpark.